Muscles in the human body are so interconnected that even one painful knot in your back can tug at your neck, which gnaws at your shoulder, which numbs your arm. Relax. With Tiger Tail therapeutic massage tools, the next time you feel a kink, just roll with it. Tiger Tail was founded by Spring Faussett, a former D-1 soccer player, whose physical therapists suggested using a foam roller or rolling pin to heal scar tissue after ACL surgery. Instead, she designed a hybrid of the two that worked more efficiently—and she manufactures it in the USA. The best selling Classic Tiger Tail is a conveniently sized (18") roller that allows for individualized pressure control. It releases and relieves sore muscles in as little as 4 minutes. The Tiger Ball is a massage ball on a rope. It targets tough areas in the neck and back. There’s also the Knotty Tiger. . . grrrrr . . . perfect for spot treatment, this baseball sized buster digs deep to alleviate tension. 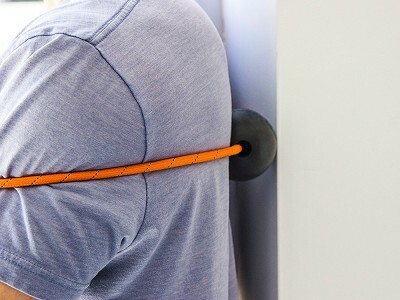 Shoulder rub and muscle knot self-massage tool. Great for the shoulders, back, arms, and other little spots. I'm Spring Faussett, inventor, entrepreneur and athlete. My personal mission is to make millions of muscles happy – every day – and I want to help you. While playing soccer I tore my ACL and endured excruciating pain while recovering from surgery. Unsuccessful at using the products recommended by my physical therapist, I invented the Tiger Tail Portable Foam Roller. I’m thrilled to be featured on The Grommet today and answer any questions you may have. Hi. I've been looking for a trigger point tool to use in between massages. I have chronic TMJD which keeps my neck and shoulders in constant tension, as well as a lower back and hips that tend to stay locked up. Between the rope and tiger, which would be the most beneficial to me? And let me add, I want and need something that will feel like it pokes a hole in the knot and lets the air out. :-). @Becca Very good question. I would say the Tiger Ball Massage-on-a-Rope would probably be your new best friend. It allows you to maintain the focal point on the trigger point - while allowing that knot to release. Based on all the areas you are trying to reach, the Tiger Ball will let you do all of them on your own. Tiger Tail can do it all too, but sometimes it works better with a buddy on the areas you describe. Will these products help with ITB injuries? I use a traditional foam roller every day to roll out my thigh but I'm wondering if these tools - specifically the Tiger Tail - could be used as an alternative? @Bridget Hi Bridget! Absolutely. Tiger Tail is the best defense against Iliotibial Band (aka IT Band, ITB) problems. The problem with a foam roller is that you have to get on the ground and a lot of the time, the pressure of using your entire body weight on the foam roller can be WAY TOO MUCH - causing a tremendous amount of pain. With Tiger Tail you are in control of how much pressure to apply. You choose where. You choose how much. It's also a lot more convenient to use, which means you'll use it more often! Hello! My mom suffers from dystonia in her neck. Which item is best for the neck, the tiger tail or the knotty tiger? @Celina Hi Celina! Good question. I would say that upper neck would be better with the Tiger Tail. It's a little easier to work the area. However, if it's lower neck- and more where the neck attached so the shoulders, the Knotty Tiger might work better for her. Personally, I like the combination of both - because there's some things the Knotty Tiger can do that the Tiger Tail cannot do (like get the tops of the shoulders easily) - and vice versa (Tiger Tail is much better at broad stroking massage). Hi- Is the knotty tiger used like a tennis ball on trigger points/knots? And what about the Tiger massage ball on a rope, it mentions using against the wall so is that how it's mainly used? I have knots all over, back problems and have also been dealing with a rotator cuff injury for months.. The pain and knots which are a result of this problem run from my jaw down through neck, shoulder, arm, etc.. Also have extremely tight hamstrings from my back issues which involve nerve compression -- Sounds like I need everything?!!! Thanks for the great questions, Sandy. Spring will be back shortly and we'll get these answered for you. @Amy Hi Amy! The Knotty Tiger is more of a hand-held slippery ball that has a really good gripper on it. That's why it's shaped like an acorn. The Tiger Ball is more like the tennis ball - except 1000 times better. The rope keeps the ball in place, while allowing you to position the ball on the wall. Much better than the tennis ball - because the tennis ball was designed for tennis! Tiger Ball was designed for massage. It is made of 100% silicone, so it's kind of "sticky" when it goes up on the wall, which allows it to grip the knot and really work it out. I would say the Tiger Ball, Knotty Tiger and Tiger Tail would help you out a lot! In the video it was mentioned you can use the tiger tail before exercising. What is the suggested amount of time to use it in order to warm up muscles? @Cindy Hi Cindy! Yes - you can definitely use Tiger Tail before you work out. In fact, I won't go running without using it first. Think of it as WD40 for your muscles. It helps warm them up and gets the kinks out before you even start your run - or any activity for that matter. To warm up, I usually recommend 30-45 seconds per muscle group. So I spend about 30 seconds on each calf, 45 seconds on my hamstrings (they are often tight! ), 30 seconds on my quads and IT bands - and then I throw in my lower back. That usually does the trick. If I find a trigger point as I'm rolling (a tender knot) I spend a little more time on that to help prevent injury. Hope that helps!